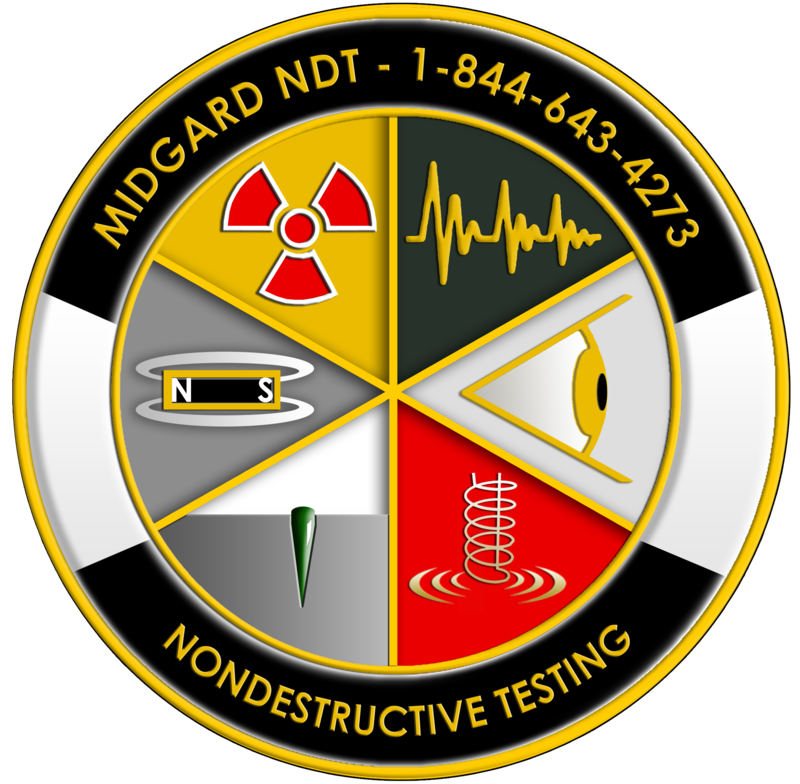 Midgard NDT inspectors provide Ultrasonic Shearwave, Thickness and Composite tests. Aircraft wing skin cracks, pressure webs, and tubing for wall thickness are just a few of the inspections for which ultrasound testing is suitable. Our certified NDT Level II and III Ultrasonic Testing Inspectors in fully accordance with NAS-410, SNT-TC-1A, ACCP or CP-189. Not only can we provide base inspections by we can also provide you with complete ultrasonic on the job training. One step further, we can teach you how to provide these services for yourself. We fully strive to bring success to your company. Common standards and codes for ultrasonic testing include ASTM E213, ASTM E1065, ASTM E164, ASTM E317, ASME Section V Article 5, and ASTM E127. Nondestructive Testing Experts can perform your Ultrasonic inspections, generate techniques, aid in pre-audit support, deliver experienced vendor audits and surveillance, produce qualified NDT inspectors and establish an NDT program to fit your specific inspection requirements. We can also include staff augmentation and shift support during elevated workloads. When you call on us, we want to ensure you are provided the highest quality service possible. Our inspectors are properly certified, all of our equipment is calibrated, and the inspectors are versed on using TCG, DAC, and sizing or categorizing weld defects. When your production begins to back up, we are more than ready to send our NDT Level II Ultrasound inspectors to expedite the job. In association with NDT partners, we are pleased to provide Time of Flight and Phased Array inspections. Complete with level III support and consulting. Phased Array classes are available regularly. All of our inspections support is available for deployment world wide. Ultrasonic testing uses high frequency sound beams to conduct inspections and take measurements. A wide range of materials including forgings, castings, welds, and composites require periodic ultrasonic inspections. A vibrating material produces what we call sound. Sound waves travel through materials by energy displacement at the atomic and molecular level. The frequency of a wave determines the pitch of a sound. Ultrasound is sound with a pitch that cannot be sensed by human ears. A piezoelectric element in a transducer is what produces ultrasound. Electrical energy is converted into mechanical vibrations and back again. Transducers are able to produce ultrasonic vibrations, transfer them into a material and then detect incoming pings from the original transference. Ultrasonic sound waves are introduced into a material, then travel in straight lines and at a constant speeds, until encountering another surface. The sounds is reflected where some return to the transducer. The reflected sound energy is detected and provides information about the reflecting surface. The time required for a wave of sound to travel, then return is measured and is the fundamental data from which internal structures can be known. Knowing the expected ping from the sound wave in contrast to the shortened ping returned from an unknown surface can indicate some internal damage such as a crack. Ultrasonic testing is commonly divided into three primary classifications. In ultrasonic straight beam testing, a sound beam is transferred into a material at 90 degrees to its surface. In angle beam testing, a sound beam is transferred into a material at an angle other than 90 degrees. Two transducers are placed on opposing sides of a material. One transducer transmits sound, and the other receives the sound. Unexpected interfaces in a material will block the sound path. The result is a partial or a total loss of sound. An indication of an ultrasonic unit will display a decrease in the received signal amplitude. The use of through transmission is useful for detecting flaws that are poor reflectors, especially when the signal strength is weak. Ultrasonic through transmission testing provides no information about the depth of a material. In pulse-echo testing, a transducer transmits a pulse of sound energy and a second transducer listens for the reflected sound energy. These reflections occur due to the presence of discontinuities and the surfaces of the test article. The ratio, of the reflected energy by the return time is displayed. The inspector then has relevant data about the size and the location of a material’s internal composition that reflect the sound.